I’ve been learning so much here at the Catholic Media Conference here in Charlotte, North Carolina! 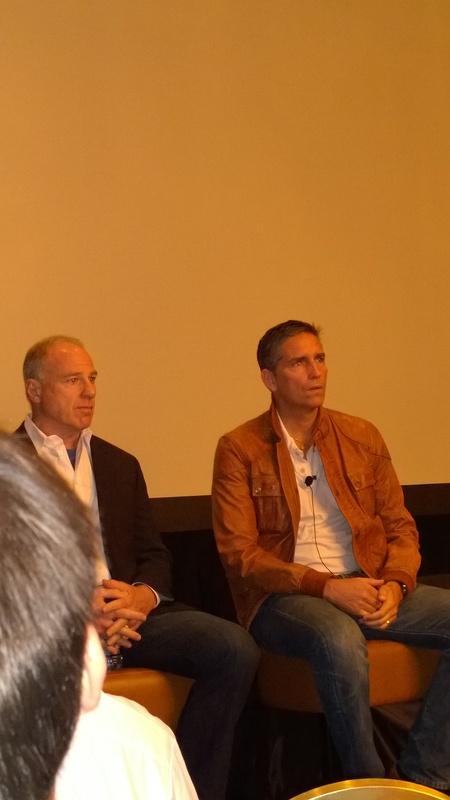 Today I learned that actor Jim Caviezel (think Passion of the Christ) is a truly humble man. At least that’s the impression I and some of my colleagues got when we met him during a private screening of his new film, “When the Game Stands Tall.” The movie is about a high school football coach leading his team on a 151-game winning streak that took place over 12 years. I can’t tell you about the film right now because I’m under embargo until its release August 22, but I can tell you that Jim Caviezel prepared well for his role and that you will absolutely love the film! I’m always excited when a film is released that is truly moral. That’s right, your entire family can watch this film and you won’t have to cover your kids eyes once during the entire thing. Therefore, I encourage – no, I’m asking – you to go see “When the Game Stands Tall” once it’s in theaters later this summer. When you spend your dollars at the box office on good, clean, films, you send the message to Hollywood that moral movies do sell. So, if we want more of them, we need to shell out our bucks at the cinema. Back to this morning. Meeting Jim Caviezel was awesome! He is completely unpretentious and seemed almost uncomfortable with the attention (and perhaps a tad nervous). I had the immediate impression that this is a man who does what he does because he feels called to do it and not because he’s seeking fame. Jim Caviezel is genuine, folks. He’s the kind of guy I’d love to have as a next door neighbor – devoted to his family, devoted to his faith, quiet and polite. He listened to everything that was said to him out of respect for the other person, not out of self-centered opportunism, as so many public figures do. More seriously, Caviezel said that he appreciated getting to know the real Bob Ladouceur (who still coaches the De La Salle team) and was grateful that Coach Ladouceur allowed him into his world in order to prepare for the role. “I felt personally responsible to play him authentically,” Caviezel said. Caviezel noted that he and Coach Ladouceur have much in common, including their Catholic faith and a background in sports. More than that, Caviezel found a part of himself in the character of Ladouceur – two faith-filled, hard working men trying to do their best at balancing work and family. His Catholic faith helps keep him on track, and he looks to that for guidance. “The foundation is always my faith,” he said. Wonderful, can not wait for the movie, and your review. It really was a pleasure to meet him, Deborah. I also was much impressed with Producer David Zelon – also authentic and dedicated to providing clean, moral entertainment for audiences. Jim Caviezel is about the most devout Catholic man that I have ever met. I had the wonderful chance (chances!) to meet him when he was doing a “book” tour, promoting the audio bible “The Word of Promise” several years ago. He really is a humble person who doesn’t revel in the limelight of Hollywood. He is a genuinely nice and sincere man who speaks from his heart and gives you his undivided attention when you are speaking to him, and he is always interested in what you have to say. I met him on 4 different occasions, and I must say, Jim is such a joy to talk to, plus very inspiring.